The Discourse of the Bread of Life is not a text to be discussed and dissected, but rather it should be meditated and pondered. This is why, even if it is not fully understood, we should not be concerned. This text of the Bread of Life demands a whole life to meditate on it and deepen it. Such a text, people have to read it, meditate it, pray it, think about it, read it again, repeat it and ponder it, as one does with a good sweet in the mouth. We turn it and turn it in the mouth until it is finished. The one, who reads the Fourth Gospel superficially, may have the impression that John always repeats the same thing. Reading it more attentively, one becomes aware that it is not a question of repetition. The author of the fourth Gospel has his own way of repeating the same theme, but always at a higher and more profound level. It seems to be like a winding staircase. By turning one reaches the same place, but always at a higher level or a more profound one. 3rd dialogue: 6, 35-40 with the people: the true bread is to do God’s will. 5th dialogue: 6, 52-58 with the Jews: Jesus and the Jews. Jesus answered: In all truth I tell you, you are looking for me not because you have seen the signs but because you had all the bread you wanted to eat. Do not work for food that goes bad, but work for food that endures for eternal life, which the Son of man will give you, for on him the Father, God himself, has set his seal. Jesus answered them: In all truth I tell you, it was not Moses who gave you the bread from heaven, it is my Father who gives you the bread from heaven, the true bread; for the bread of God is the bread which comes down from heaven and gives life to the world. 'Sir,' they said, 'give us that bread always.' Jesus answered them: I am the bread of life. No one who comes to me will ever hunger; no one who believes in me will ever thirst. a) The people were hungry, they eat the bread and they look for more bread. They seek the miracle and do not seek the sign of God who was hidden in that. What do I seek more in my life: the miracle or the sign? b) Hungry for bread, hungry for God. Which of these two predominates in me? c) Jesus says: “I am the bread of life”. He takes away hunger and thirst. Which of these experiences do I have in my life? 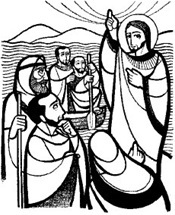 In today’s Gospel we begin the Discourse on the Bread of Life (Jn 6, 22-71). After the multiplication of the loaves, the people follow Jesus. They had seen the miracle; they had eaten and were satiated and wanted more! They were not concerned about looking for the sign or the call of God that was contained in all of this. When the people found Jesus in the Synagogue of Capernaum, he had a long conversation with them, called the Discourse of the Bread of Life. It is not really a Discourse, but it treats of a series of seven brief dialogues which explain the meaning of the multiplication of the bread, symbol of the new Exodus and of the Eucharistic Supper. The conversation of Jesus with the people, with the Jews and with the disciples is a beautiful dialogue, but a demanding one. Jesus tries to open the eyes of the people in a way that they will learn to read the events and discover in them the turning point that life should take. Because it is not enough to follow behind miraculous signs which multiply the bread for the body. Man does not live by bread alone. The struggle for life without mysticism does not reach the roots. The people, while speaking with Jesus, always remain more annoyed or upset by his words. But Jesus does not give in, neither does he change the exigencies. The discourse seems to be a funnel. In the measure in which the conversation advances, less people remain with Jesus. At the end only the twelve remain there, but Jesus cannot trust them either! Today the same thing happens. When the Gospel beings to demand commitment, many people withdraw, go away. John 6, 24-27: People look for Jesus because they want more bread. The people follow Jesus. They see that he did not go into the boat with the disciples and, because of this, they do not understand what he had done to reach Capernaum. They did not even understand the miracle of the multiplication of the loaves. People see what has happened, but they cannot understand all this as a sign of something more profound. They stop only on the surface; in being satisfied with the food. They look for bread and life, but only for the body. According to the people, Jesus does what Moses had done in the past: to feed all the people in the desert. According to Jesus, they wanted the past to be repeated. But Jesus asks the people to take a step more and advance. Besides working for the bread that perishes, they should work for the imperishable food. This new food will be given by the Son of Man, indicated by God himself. He brings life which lasts forever. He opens for us a new horizon on the sense of life and on God. John 6, 28-29: “Which is God’s work?” The people ask: what should we do to carry out this work of God? Jesus answers that the great work of God asks us to “believe in the one sent by God”. That is, to believe in Jesus! Jesus responds that the bread given by Moses was not the true bread from heaven. Coming from on high, yes, but it was not the bread of God, because it did not guarantee life to anyone. All of them died in the desert (Jn 6, 49). The true bread of heaven, the bread of God, is the one which conquers death and gives life! It is the one which descends from Heaven and gives life to the world. It is Jesus himself! Jesus tries to help the people to liberate themselves from the way of thinking of the past. For him, fidelity to the past does not mean to close up oneself in the ancient things and not accept renewal. Fidelity to the past means to accept the novelty which comes as the fruit of the seed which was planted in the past. John 6, 34-35: “Lord, gives us always of that bread!” Jesus answers clearly: “I am the bread of life!” To eat the bread of heaven is the same as to believe in Jesus and accept to follow the road that he teaches us, that is: “My food is to do the will of the one who has sent me and to complete his work!” (Jn 4, 34). This is the true food which nourishes the person, which transforms life and gives new life. in the meeting-place of honest people, in the assembly. to be pondered by all who delight in them. his saving justice stands firm for ever. Yahweh is mercy and tenderness. he keeps his covenant ever in mind. in giving them the birthright of the nations. accomplished in fidelity and honesty. holy and awesome his name. those who attain it are wise. His praise will continue for ever. Lord Jesus, we thank for the word that has enabled us to understand better the will of the Father. May your Spirit enlighten our actions and grant us the strength to practice that which your Word has revealed to us. May we, like Mary, your mother, not only listen to but also practice the Word. You who live and reign with the Father in the unity of the Holy Spirit forever and ever. Amen.